Griffith is an African American living in a city quickly associated in the minds of most Americans with Cold War intrigues and/or World War II Nazi-era excesses. However, Griffith said race-based ugliness has not proved a major problem in either his professional or personal experiences. Griffith has made an artistic mark in Berlin, a city that does not enjoy recognition as a nourishing place for artistic expressions by African Americans on par with Paris, France. The ambitions Griffith referenced ignited an artistic odyssey that grew from his decision to accept an invitation to come to Berlin in 1979 to perform in a Broadway-style musical. 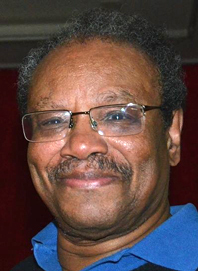 That odyssey created a body of accomplishments that have received accolades for his elevating the recognition of African American culture in Berlin. Those ambitions Griffith held grew into institutions, the first being Fountainhead® Tanz Théâtre, an arts and cultural organization founded in 1980. Griffith said a mission of Fountainhead® Tanz Théâtre is to confront violence and prejudice through various cultural activities. Six years after the founding of Fountainhead® Tanz Théâtre, Griffith produced and directed the first European Black Cultural Festival, a three-week long event that featured the contributions of Black people to world culture through film, theater, dance, music, workshops and seminars. That Cultural Festival included a Black International Cinema Berlin. That cinema event, now held annually, showcases films with subject matter about Black people but is not limited to Black issues only. The prestigious group, Europe For Festivals/Festivals For Europe (EFFE), has ranked the Black International Cinema Berlin among Europe’s finest annual festivals. Griffith has taken Black International Cinema Berlin to other cities in Europe and America. Achievements in Berlin led to the invitation from the University of Indiana in South Bend (USA) for him and his wife, ballerina Gayle McKinney, to create a dance theater department. While at that university from 1992-1995, the pair travelled annually to Berlin to produce the film festival and other cultural activities. Another Fountainhead® Tanz Théâtre endeavor is Griffith's hosting of THE COLLEGIUM, a television program with a magazine-style format broadcast regularly in Berlin and other German cities. Griffith credits his parents, a psychologist father and classical pianist mother, for inspiration along with his mentor, the legendary jazz vocalist/civil rights activist Oscar Brown Jr. Griffith once served as Brown’s manager.